Modern people have long been aware of lacking something that neither our ideologies, nor our addictions nor our consumerist frenzies can satisfy. Searching for it, millions have sampled Asian spirituality and discovered contemplative practices that ground their lives in authentic values, while others have rediscovered their Christian or Jewish roots. The choice is personal, mysterious, and utterly unpredictable. Still others have concluded that monotheism itself is the source of our dilemma. We need an imagination that encompasses psychology and addresses the plural patterns of the soul. From the perspective of polytheism, to ignore any of the gods can mean that some aspect of our consciousness is so much in the foreground that it has pushed others out of awareness. However, if we believe that spirits and ancestors are merely inside us, we are reducing them to psychological figures. Pagans prefer to see them as imaginative worlds of meaning in which we participate, as reflecting natural forces both of the universe and of the human soul. Metaphor transmits multiple levels of meaning and invites dialogue. Consider that some languages lack the verb “to be.” Speakers must communicate indirectly, tolerate ambiguity, and endure the tension between opposites, rather than settling for the “either-or” resolution characteristic of monotheism. They think mythologically, identify the archetypal nature in events, and recognize that the literal, psychological, and symbolic dimensions of reality complement each other to make a greater whole. There is no reason to assume that indigenous people cannot do this. Actually, it is we who have, by and large, lost this capacity. The curses of modernity – alienation, racism, environmental collapse, totalitarianism, consumerism, addiction, and world war – are the results. When modern people confuse our myths with historical truth, or if we allow dogma to determine the effect the symbol is supposed to have, the symbol dies. Since monotheism generally rejects ambiguity, it requires belief, which implies not merely a single truth but also the obligation to convert – or eliminate – others. It invites misogyny, intolerance, and hatred of the body. Pagan thinking appreciates diversity and encourages us to imagine. Myth is truth precisely because it refuses to reduce reality to one single perspective. For these reasons, we have chosen to experiment with living rituals from many indigenous cultures, rather than to follow one path exclusively. But why are we called to celebrate the Day of the Dead? For years, I (Barry) would dread the approach of Fall, when I’d experience all kinds of accidents and minor illnesses. Eventually, I realized that it was my own darkness that I’d been unwilling to examine. We learned about the Celtic view that the world moves annually between the Light and Dark halves of the year, and we began to approach these transitions ritually, to welcome the darkness. Twenty years ago, after long-term experience with Spiral Dance and men’s mythopoetic work, we began to offer rituals to provide an opportunity for communal grieving. Many indigenous cultures recognize annual periods, such as the Celtic Samhain, when the veil between the worlds is the thinnest, when the boundaries between the seen and unseen worlds become permeable, and the spirits of the dead walk briefly among the living, to eat the foods they loved when they were alive. These are times for loving remembrance. They are also liminal, sacred times, when great things are possible. And they are dangerous times, since some spirits are hungry for more than physical food. The old gods are returning as they sense our interest in healing the unfinished business of the past. Indigenous cultures from Bali to Guatemala agree that there is a reciprocal relationship between the worlds. What is damaged in one world can be repaired by the beings in the other. Thus, such cultures affirm that many of our problems actually arise because we have not allowed the spirits of the dead to move completely to their final homes. They say that the ancestors require two basic things from us: beauty and our tears. The fullness of our grief, expressed in colorful, poetic, communal celebrations, feeds the dead when they visit, so that when they return to the other world they can be of help to us who remain in this one. And by feeding them with our grief, we may drop some of the emotional load we all carry simply by living in these times. The ancestors can aid the living. But they need our help to complete their transitions. Without enough people weeping for it on this side, say the Mayans, a soul is forced to turn back. Taking up residence in the body of a youth, it may ruin his life through violence and alcoholism, until the community completes the appropriate rites. This is the essential teaching: when we starve the spirits by not dying to our false selves and embodying our authentic selves, the spirits take literal death as a substitute. Such beliefs are nearly universal, except, of course, in modern culture, particularly in America culture, which relentlessly pressures everyone to be upbeat and deny death. We have all known the frustrating atmosphere of American funerals, with their restrained emotional expression, where family members are encouraged to keep a “stiff upper lip,” and clergy lecture that the “departed” is “with Jesus” or in a “better place.” To a pagan, what could be a better place than this Earth? We feel that the inability to achieve closure haunts the American soul. Looking back at the charred ruins of history’s most violent century, we notice certain factors. One is the resolution of disputes through distanced, high-tech violence that insulates us from the consequences of our actions. The second is the Anglo-Saxon cult of masculinity that prevents men from shedding tears. The third is the massive, karmic (there is no other word for it) weight of our ungrieved histories of genocide, slavery, and empire. Is it any wonder that (white) Americans cry so sparingly at funerals? This is why we have found it so helpful to utilize ritual elements and stories from cultures that understand the critical value of grief work. As pagans, we entertain the possibility that if there is such a thing as truth, it resides in many places. We know that some indigenous teachers dislike whites appropriating their traditions. We have wrestled with the notion of cultural appropriation here. However, we have discovered that, at their essence, many tribal cultures reveal a surprising similarity of intention, especially in their grief rituals. Besides, we feel that the times are too painful and the need too strong to reject anything authentic. We need all the help we can get. Indeed, Malidoma Somé has encouraged us to take his West African Dagara grief rituals into our communities. 1 – Even without having lost loved ones recently, we all carry immense loads of unexpressed grief. 2 – Desiring healing as much as we do, beings on the other side of the veil call to us continually. But it is our responsibility to approach them through ritual. 3 – Grieving may never completely end, but we can clarify our intentions to achieve closure with old wounds and with those who are no longer with us. Unfinished business keeps us from focusing on future goals. Dropping some of that weight makes room for a new imagination. 4 – Releasing emotions requires a safe space and a caring community. The Dagara say that a person sick with grief sickens the whole village, so grieving must be communal work. They would simply not understand when an American says, “I just need to be alone with my sadness.” Hence the need to create and nurture community, even if only briefly. 5 – Having inherited a Western tradition deeply suspicious of the imagination, we know how difficult it is to let go. 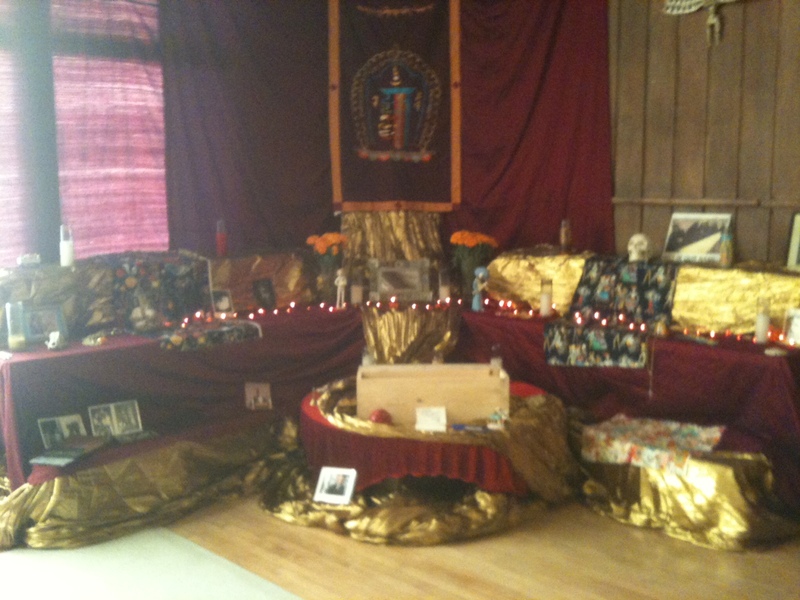 So we tell poems (recited, not read), guide meditations, name the past year’s dead, chant and build altars. Stories and grief songs from many indigenous traditions help pull us out of normal, emotionally restrained consciousness. 6 – We must move the emotions. When ritual involves the body, the soul (and the ancestors) take notice. We dance our grief. 7 – Experience tells us that things usually go in a certain way – toward resolution. But this is not church. “Radical ritual” is by nature unpredictable. We respectfully invoke the spirits, but we never know how or when the ritual will end. 8 – Ritual of this nature, like any initiation, involves sacrifice. We attempt to release whatever holds us back, sabotages our relationships or keeps us stuck in unproductive patterns. In this imagination, the ancestors are eager for signs of our commitment and sincerity. What appears toxic to us, that which we wish to sacrifice, becomes food to them, and they gladly feast upon it. We encourage the gradual buildup of emotion, structuring the day around certain basic, recurrent themes, such as exile or imprisonment. Each year we tell a story from a different tradition. Participants break up into small, facilitated groups, where we prompt them to speak with questions such as these: What haunts you? Are you in exile from home? Family? Society? Have you exiled or hurt others? Personal losses? Abortions? Choices not to have children, etc. What have you sacrificed in order to survive? Are you clinging to something that must die? Eventually we move into extended chanting and drumming. All stand before a beautiful water shrine, which beckons them to literally and symbolically lay their burdens down. Here, the community is critical. As dancers leave the “village” and approach the shrine to weep, scream or silently address their ancestors, the singers and drummers encourage them. One can feel both the “pull” of the ancestors and the “push” of the community. Ideally, participants return to the village cleansed from their ordeal. The community welcomes them enthusiastically, because such people are now more capable of giving their “original medicine” to others. We conclude with more poetry, statements of intention for the coming year, and a feast for the tired souls who have worked so hard to feed the spirits. This year the Ritual will take place in El Cerrito (just north of Berkeley) on Saturday, November fourth. Work scholarships are available, and no one will be turned away for lack of funds. This entry was posted in Uncategorized and tagged Barry's Blog # 25: The Background to Our Day of the Dead Ritual. Bookmark the permalink.